After the completion of phase one, the Children's Garden at Evergreen Brick Works has reopened for nature play, supported by Hain Celestial. 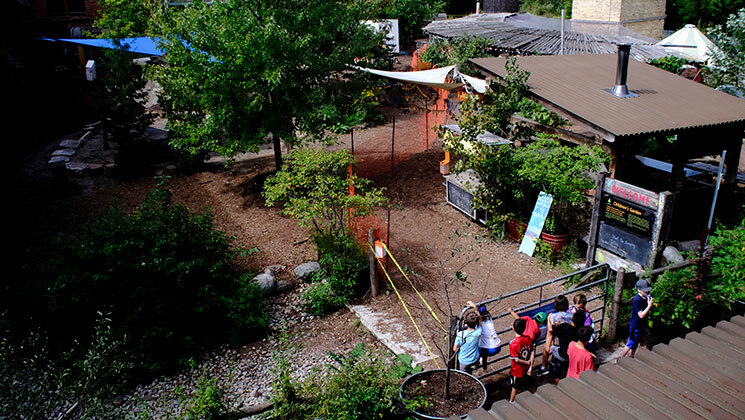 Throughout the month of September, children visiting Evergreen Brick Works were eagerly peeking through the gate of the Children Garden, excited to start playing with the new elements we were adding in to refresh, enhance and evolve the landscape. With phase one of the Children’s Garden revitalization now complete, the gate has reopened to the public! Children eagerly awaiting the reopening. Evergreen has been working hard to transform the Children’s Garden – planning, designing and building a space that is a unique combination of place-based education, loose parts play and site design that evolves with the seasons and user interaction. The new elements lead the way for both children and adults to test, discover and learn about how we play outdoors, so we can introduce these spaces and ideas all across Canada. In just one day of children interacting with the new elements, the space already began to evolve. 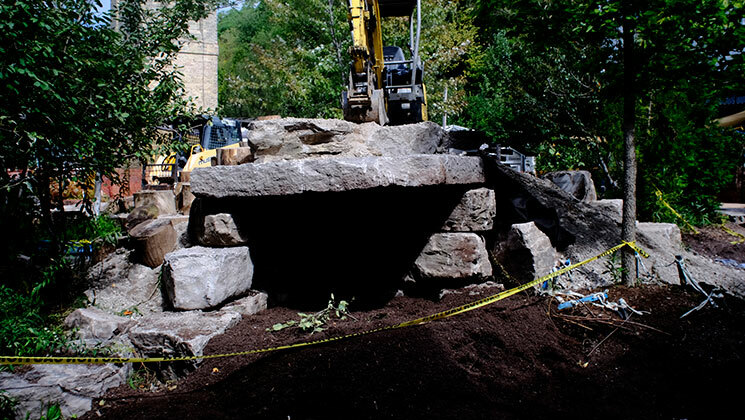 The Wolf's Den under construction during phase one. The start of October signified the reopening, where kids in our first PA Day Camp of the year got to be the lucky ones to get their hands on the new additions to the Children’s Garden for the first time. As true architects of the space, children in the camp took this first day as an opportunity to demonstrate their own ways of redeveloping of the space. Loose parts – sticks, bricks, rocks and logs – were gathered, wheelbarrowed around and used to decorate the Wolf’s Den. Students wheeled loose parts across the Garden to decorate the Wolf's Den. Climbing up the new elevated landscape on rock and wood steps, students draped textiles and twigs across the entrance, making it a den of their own for the day. Peter Demakos, who works as Project Coordinator for Outdoor Play and Learning at Evergreen, was excited to see how the changes encouraged new methods of collaborative play. Students explore the new Wolf's Den in the Children's Garden. The new features were built in addition to the existing loose parts play and water stations. Phase two will see the creation of a new Water Works Studio in spring/summer 2019. Learn more about the next phase of the project. The Children’s Garden is open to the public to come play, learn and explore for the rest of this year and early next year. Phase two of this exciting revitalization will begin in Spring 2019. Stay tuned for more updates from the Children's Garden as the revitalization continues! Photos taken by Layah Glassman. Hain Celestial is a proud supporter of children’s nature play at Evergreen. What happens when you animate a city park? Children, parents and the community at large have been transformed thanks to Neighbourhood Nature Play. We have the privilege to meet amazing teachers and early childhood educators at our Professional Learning Workshops.